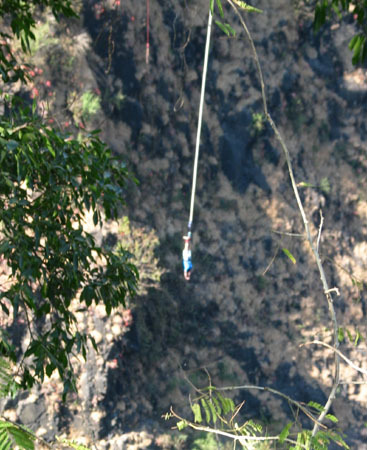 The ultimate adrenalin thrill—that’s how bungee jumping is described by those whose business is cajoling the young and arguably foolish to try it. A few years ago, after watching a young woman take the plunge—and listening to her blood-curdling scream as she plummeted from the bridge over the Zambezi River in Zambia, Africa--I decided not to risk a heart attack for the sake of a few thrilling moments. 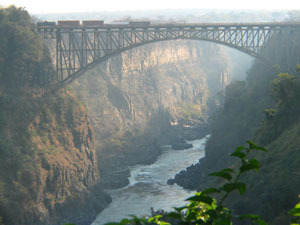 Bridge over the Zambezi River between Zambia and Zimbabwe where bungee jumping takes place. While on a white water rafting trip—an exciting adrenalin rush itself—we witnessed a jump at the exact same spot as the one that almost ended in disaster for a 22-year-old Australian tourist on New Year’s Eve. You may recall news reports or have seen the Internet video replay of the terrifying moment when the elastic cord attached to her legs snapped and she plunged into the Zambezi River. 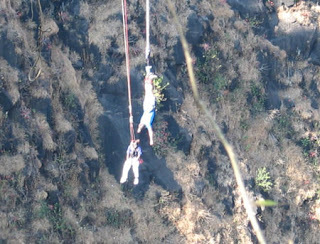 Falling from a height of 365 feet and hitting the water with such force left her body seriously bruised and battered. “Everything went dark,” she said, calling her survival a miracle. Quick work from rescuers saved her from possible attack by crocodiles in the river. (Yes, we saw those crocs during our rafting experience—a strong reason we worked hard to keep our raft upright). Of course, the company has defended its safety record (150,000 jumps without accident). And the Tourism Minister took a plunge himself to prove that the broken-cord incident was a fluke. Yet, you can’t over emphasize the potential hazards that are an inherent part of extreme activities. There is always the risk of equipment failure or human error which may add to the excitement for some people but have also resulted in fatalities. A pair of jumpers on the recoil. Just a month after our white water trip, another young Australian tourist died on the exact same excursion with the same outfitter we used. The raft she was on turned over, and when rescuers tried to lift her out of the rapidly flowing water into a raft by grabbing onto her life jacket, she slipped out and under the water and was never seen again. Still, I'll probably raft in white water again. I try to assess risks and keep my own abilities and tolerances in mind. A bit of adrenaline rush is exciting, but good sense is important when evaluating the amount of risk you’re willing to take.